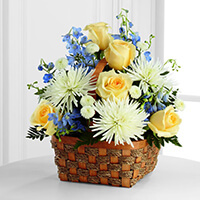 Provide comfort for the family of Mary Holmes with a meaningful gesture of sympathy. Jay Richardson family sent flowers to the family of Mary Joan Holmes . How grateful we are for the life and legacy of Joan Holmes. We have so many fond memories of her working in the dental office with our dad. We loved her, such a special lady. Jay Richardson family purchased the The FTD Heavenly Scented Basket for the family of Mary Holmes . May the many precious memories you’ve shared with Mary ease your pain in the days ahead. As you Look forward to seeing her in a world where you will be united forever, hold this promise dear to your hearts: “And he (Jehovah) will wipe out every tear from their eyes, and death will be no more, neither will morning nor outcry nor pain be anymore”. May comfort and the peace of God guard YOU during this sad time.